A hermit crab’s shell is his home and his protection from predators and desiccation. Hermit crabs take up residence in discarded shells and can not make their own shell. When kept as pets it is important that you choose suitable shells for your hermit crab. Provide 3-5 suitable shells per hermit crab. Shells can be placed directly on the substrate or in a designated bin that we call a Shell Shop. This helps keep the shells clean and reduces the chances of them being buried. In semi-terrestrial hermit crabs a well-fitting shell is essential for maintaining low evaporation rates and carrying ample water. An appropriately sized shell in good condition allows invasion of inland environments offering more shade, food and fresh water for C. clypeatus studied on Curacao. 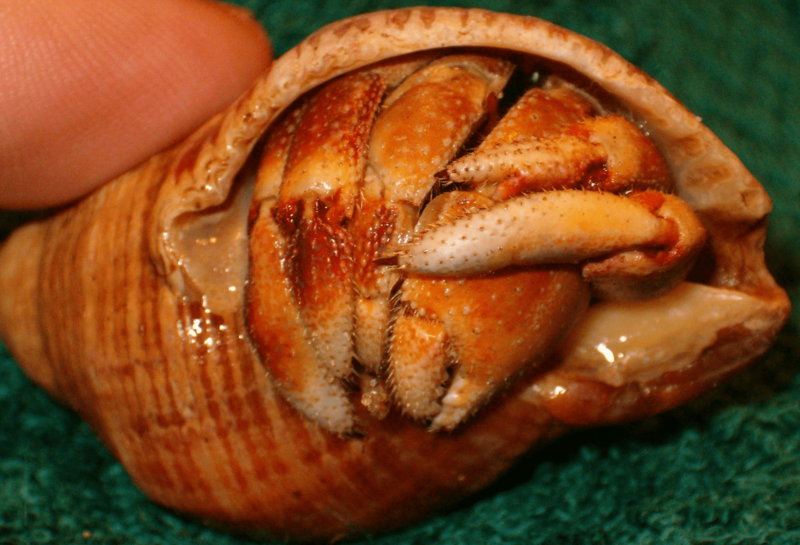 Hermit crabs with broken, ill-fitting shells are restricted to the coast, must rely on drinking saltwater, and appear to be in relatively poor condition. Hermit crab’s should be allowed to choose the shell they prefer from a selection of different sizes and types of shells. Natural shells are the best option. Painted shells should be avoided. Shells should not have jagged edges or holes in them. 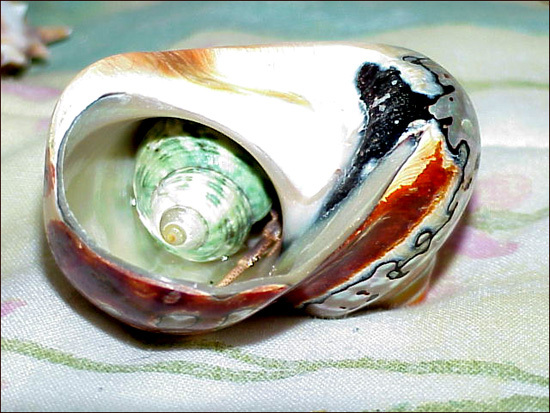 Most species of hermit crabs will prefer a shell with a round opening. Coenobita compressus (Ecquadorian) prefers a shell with a D shaped opening. Coenobita violascens prefers a long spiral type shell. Shells should be cleaned and boiled in Prime treated water before offering to your hermit crabs. Many owners also do a final rinse in ocean water before placing in the crabitat but this is not required. ***If you collected shells from the beach be sure the shells are EMPTY before bringing them home. Hermit crabs can be very stubborn about changing shells but do not attempt to force a crab from it’s shell. How to measure the opening of the shell. My shell is too small! My shell fits just right! C. violascens enjoy long spire type shells. Despite these hermit crabs being forced into these shells, they are NOT acceptable. These are not only covered in clear varnish but the shell spiral is wrong for a hermit crab. They will not voluntarily wear these delphinias. These are covered in clear varnish. Cassispilia not an ideal shell due to the long narrow opening and rough edges but is worn in the wild. Muffin shells are often sold as hermit crab shells but I never once had one of my crabs even try them on. When and why do hermit crabs change shells? Contrary to common belief, a molt does not mandate a shell change! 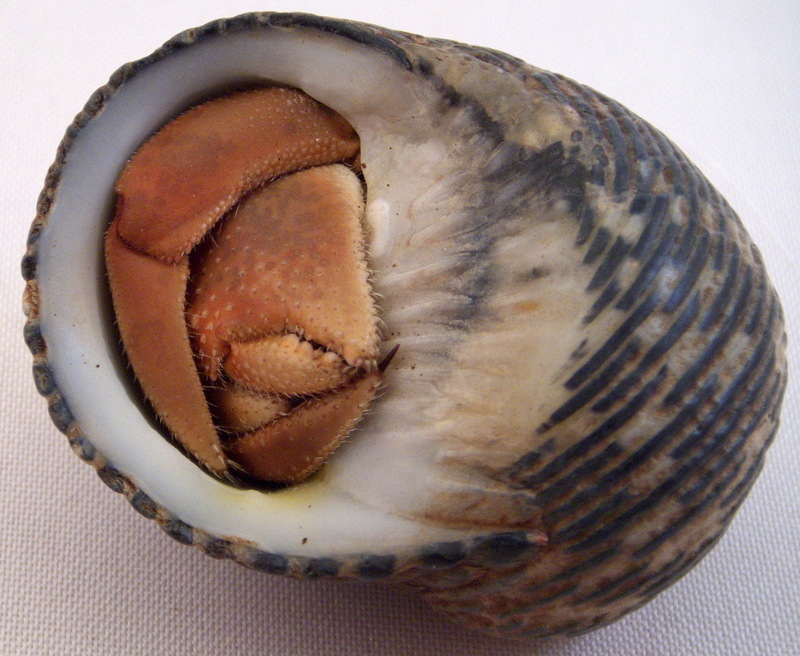 If the existing shell is roomy enough to allow for growth during a molt, the hermit crab may feel no need to change shells. Additionally, you will find some hermit crabs are chronic shell shoppers, always trying on something new. Next Post: Two more Local Reps join our team!